A few weeks ago, my roommates and I attended Bologna’s “Arte e Scienza in Piazza,” which aimed to educate and inspire visitors by integrating art and science in its exhibition. 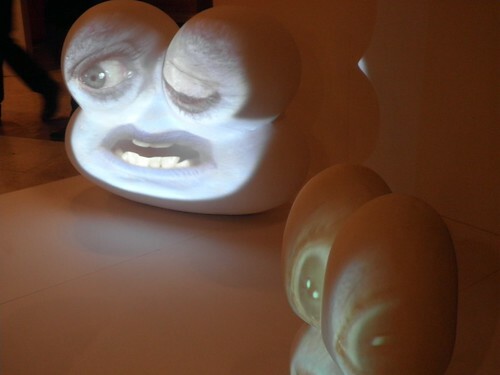 The above multimedia installation by New York artist Tony Oursler was featured in exhibit that explored the relationship between people and technology. As these strange eyeballs blinked at me and whispered esoteric, prerecorded secrets, I noticed people snapping photos from a bench in front of it. When they moved on, I hopped in their place, then realized the pair of eyes on the right had turned to shadow. A security guard headed in my direction—turns out the “bench” was part of the instillation and my backside temporarily shorted its circuit. What the heck?! Don’t make art that looks like chairs if you don’t want people sitting on it! I grabbed my roommates and informed them that we needed to get out of there, but when we were leaving the show, I saw that other people were making the same mistake that I did. 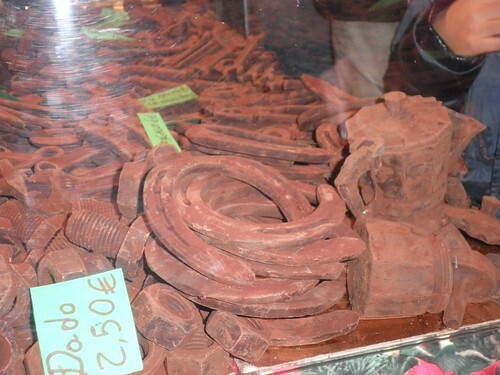 I’d never seen an espresso maker made of chocolate before I attended Bologna’s annual outdoor chocolate festival in November. Though the vendor stalls were packed, the mob of people did not warm the frosty air with any body heat. Thankfully there was spicy, dark hot chocolate for sale! 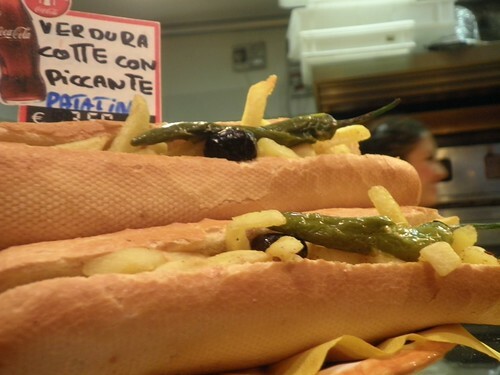 This sandwich, also spotted in Bologna, did not look as appetizing. French fries and jalapeños, anyone?